"Designers play an increasingly influential role in shaping commerce and culture." Graphic design is one of the most powerful art forms of our time. Design is commercial, social, public, and political. It shapes the meaning and impact of books, magazines, websites, leaflets, posters, advertisements, logos, film titles, and countless other media. Everywhere you look, designers are using words and images to penetrate people's hearts and minds. As we enter the golden age of design in startups, highly talented user-interface and product designers are becoming ever more important. Some companies leading the charge are Apple, Path, Pinterest, Square, and Airbnb. What those companies have in common is that design is at the core of their businesses. Graphic design shapes all forms of media and products in the political, public and commercial spheres. Undergraduate study in graphic design often leads to a Bachelor of Fine Arts (BFA). To become a graphic designer it takes expertise, experience, skill, and a good education. 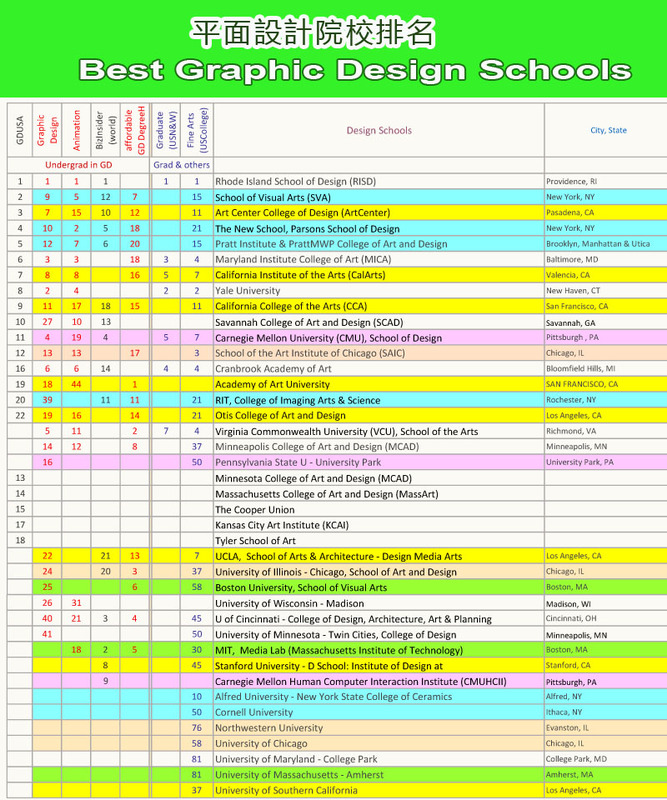 Graphic design programs can be found both at art schools and as departments within larger universities. Finding the right graphic design degree program can sometimes be a challenge which is why Litz USA has compiled a couple of renowned rankings for our readers, we also put alongside the their Fine Art ranking to give you a broader view of the school. Litz’s Elite program help you achieve your dream to be a graphic designer, in the past we’ve placed students in some of the famous design schools including Maryland Institute College of Art (MICA). Students can also start from some of our small private liberal arts colleges and transfer to the design schools from Junior (3rd year). We’ve students going to Parson from both Dean College and Albright College. Formerly Academy of Art College, it is a privately owned for-profit art school in San Francisco. It was founded by Richard S. Stephens in 1929, and is now owned by the Stephens Institute. Academy of Art University offers an online environment that allows the student to interface with his or her materials and take charge of his or her learning, preparing students for challenging careers in the graphics arts. Established in 1885, it is home to more than 80,000 students across five campuses including Tempe, West (Glendale), Polytechnic (Mesa), Downtown Phoenix, and Thunderbird (Glendale). The Institute offers a variety of undergraduate and graduate programs for aspiring graphic designers including a Bachelor of Science in Design (BSD) in Graphic (Visual Communication) Design and a Master of Science in Design (MSD) with a Concentration in Visual Communication Design (Graphic Design). Also known as MVCD, the MSD program features two-year and three-plus-year options. The Two-year program is a studio-based program that consists of 60 hours of study and the three-plus-year program is a 102-hour studio-based program. The 102-hour program is designed for students that do not have an undergraduate degree in visual communication or graphic design. Founded in downtown Los Angeles as the Art Center School, Art Center offers a wide variety of art and design fields, as well as public programs for children and high school students, and continuing studies for adults in the Los Angeles metro area. It is one of the few schools to offer a degree in Interaction Design. Art Center College has an international reputation for its rigorous, transdisciplinary curriculum, faculty of professionals, strong ties to industry and a commitment to socially responsible design. The school has roughly 2,000 students, undergraduate and graduate. This prestigious school has been at the forefront of graphic design for more than 80 years. The graphic design program at Pasadena takes seriously the fact that graphic design today forces students to become competent with traditional skills, as well as with motion, culture, and various media which are fluid. Emphasis is placed on teaching students how to change with an industry that refuses to stand still. An accelerated approach describes the Art Center. The program focuses on formal design principles, with an emphasis on craft and aesthetics. Specialization in a single area finishes out the degree. The curriculum combines manual art with computer-based design to help students explore and experiment with everything from magazine layouts to 3D. Bachelor & Master Programs – These programs integrates design with modern business elements; a great choice for artists who are also entrepreneurs. The program spans over 8 terms with classes in narrative sketching, motion graphics and transmedia just to name a few. The program offers unique exchange student opportunities both in the US and in the EU. Its Graphic Design Program prepares students to practice visual communication in a competitive global environment. Auburn’s nationally regarded BFA is NASAD accredited and concentrates on interactive design and mobile design, user experience design, strategic branding, typography, publication design, packaging, illustration and image making, and fine arts. Students receive hands-on design instruction in a professional studio environment with a strong sense of community among students and faculty. Courses emphasize a systemic approach to design by incorporating cross-disciplinary collaborations and train students to become versatile designers and art directors. Chartered in 1845 by the Republic of Texas, it is home to more than 16,000 students enrolled in more than 250 degree programs across nine undergraduate colleges and schools, a seminary, a graduate school, and a nursing school. The College of Arts and Humanities houses the Department of Art, which offers seven degree programs. Programs for aspiring graphic designers include a BFA in Graphic Design. Founded in 1839, Boston U is an internationally recognized institution of higher education and research. With more than 33,000 students, it is the fourth-largest independent university in the U.S. Established in 1954, the College of Fine Arts offers professional training in the arts in conservatory-style environments for undergraduate and graduate students complemented by a liberal arts curriculum for undergraduate students. Boston University School of Visual Arts Graphic Design program is a traditionally based program. Students will learn anything from photography to critical evaluation of the print. They will also study typography as an element of design; and learn to relate three-dimensional graphics to architectural and package design. The faculty provide honest real world insight, countless avenues for creative inspiration, and insider knowledge of design studios, thoroughly preparing students for post-collegiate life. Students also participate in interdisciplinary projects across the campus. Bowling Green State University (BGSU) was founded in 1910. It is home 19,000 students enrolled in more than 200 programs across nine colleges. The College of Arts and Sciences is home to the School of Art, which houses the Division of Graphic Design (BGSUGD). The Division offers a BFA in Graphic Design. Graduates of the program go on to become graphic designers, communications specialists, and art directors in a variety of fields with major corporations and creative firms across the U.S.
Brigham Young University (BYU) College of Fine Arts and Communications has a four year BFA in Graphic Design that includes study of composition in branding and commerce. BYU was founded in 1875 by The Church of Jesus Christ of Latter-day Saints (LDS). The school is home to 26,700 undergraduate students enrolled in 100+ programs across more than a dozen colleges and departments. The Department of Design offers several programs for aspiring graphic designers. Options include BA and BFA degrees in Design with a Graphic Design Emphasis. The BA requires completion of 45 credit hours in Graphic Design (GD) and the BFA requires 73 GD credit hours. Founded in 1907, CCA is an independent art college offering 22 undergraduate and 10 graduate programs in the areas of design, fine arts, architecture, and writing. It has campuses in San Francisco and Oakland, and currently enrolls approximately 1,500 undergraduates and 400 graduate students. Graphic design at CCA is a media-blind discipline that engages the mind and the senses by translating ideas - from simple to complex, into the communication of information, emotion, and reflection. Taught by some of the most recognized practitioners, scholars, and theorists working today, the graphic design students learn to identify problems and find solutions that move people to think, feel, and act. The offering is solutions-based, with curriculum that uses an inquiry-based approach to help the student develop the skills from ideation to problem solving. The college educates students to shape culture and society through practice and critical study. Finely honed and constantly self-evaluated, the program has been recognized for its consistently high level of teaching as well as for its remarkable, award-winning student work. Bachelor of Fine Arts (BFA) - CCA offers BFA in Graphic Design, consisting of a total of 126 credits. The curriculum includes hands-on studio courses, core major requirements and general education coursework. Students can participate in an internship with a design firm. CCA also offers a Master of Fine Arts (MFA) in Design with courses in graphic design. Notes. This school has a comparably low student-to-faculty ratio of 8:1 | CCA has around 480 faculty members, with the vast majority of them teaching undergraduate courses | Student-exchange program with over 30 different arts schools in numerous cities | The school has $20 million in scholarship funds, with the average amount per undergraduate recipient at nearly $18,000 | Founded in 1907 by Frederick Meyer, California College of the Arts (CCA) is a 4-year not-for-profit private school. CalArts was established in 1961 by Walt and Roy Disney and is the nation’s first higher education institute to offer undergraduate and graduate degrees in both the visual and performing arts. Disney envisioned CalArts as a place where students from all artistic disciplines could develop in a collaborative, workshop-centered environment. CalArts is a highly regarded private art college near Los Angeles, and it is home to around 1,490 students enrolled in more than 70 programs at all degree levels. CalArts is a combination of six art schools in one, they offer programs in Art, Graphic Design, Photography & Media, and Art & Technology. Graphic Design Program - Offerings include a BFA in Graphic Design, an MFA in Graphic Design with courses in web and interface design; motion graphics; print and publication design; branding, identity, and type design; as well as in design history and education. The BFA Graphic Design program is fairly small, with only about 20 new students each year. Many alumni go on to work for film, television, and major tech companies. The curriculum emphasizes both practical and conceptual skills. Throughout its history, the program in graphic design has been home to prestigious design educators and has produced influential graduates, garnering a reputation for boundary-pushing visual experimentation and academic rigor. In both the BFA and MFA programs, students create a body of work that is not simply a string of assignments, but which is uniquely theirs, preparing them, upon graduation, to carve an independent path into design practice. The Graphic Design programs prepares students for a wide range of professional careers that could be anything from publication design to web design, from film title and broadcast design to exhibition design, from type design to a career in design education. Established in 1947, it is home to 27,000 students enrolled in more than 300 programs across eight colleges and dozens of departments. The College of Arts and Letters, Department of Art offers a BA in Graphic Design/Visual Communication. The program prepares aspiring graphic designers to work in today’s digital media and print industries. Besides internship opportunities, the program offers access to the Luckman Fine Arts Complex, the TV, Film and Media Center, and internship opportunities at the Getty Center. Founded in 1900, it is home nearly 13,000 students enrolled in more than 100 programs across seven colleges. CMU is a leader in the integration of arts and design with technology and user research. By specializing in both the creative and technical fields, Carnegie Mellon ensures a quality, skills-based education while offering unique opportunities for interdisciplinary collaboration. The School of Design offers a Bachelor of Design degree (BDes, equivalent in rank to a BFA) with a Specialization in Communication. BDes students have the opportunity to pursue a more interdisciplinary focus that combines two of the following three areas: Product (Industrial) Design, Communication (Graphic) Design, and Design of Physical and Digital Environments. The School has a BFA and an MFA program, within which are housed several major options – one of which is graphic design. Founded in 1859, Cooper Union trains its students to establish his or her own design ideals by offering them the training and discipline in thinking in order to achieve those ideals. This has undergraduate programs in Graphic Design and in Digital Media Design. Established in 1914, it is home to nearly 800 students from 35 states and 18 countries. Cornish awards BFA degrees in areas from Art to Theater as well as a Bachelor of Music (BMus), and a Post-Baccalaureate Artist Diploma in Early Music. Programs for graphic designers include a BFA in Design with a Specialization in Visual Communication and Motion Design. The program, which covers everything from graphic design to social and digital media, is offered through the Department of Design. Cranbrook Academy of Art is a top ranked, graduate-only programs in architecture, design and fine art. Each year, just 75 students are invited to study and live on our landmark Saarinen-designed campus, which features private studios, state-of-the art workshops, a renowned Art Museum, and 300 acres of forests, lakes, and streams, all a short drive from the city of Detroit. The focus at Cranbrook is on studio practice in one of ten disciplines: Architecture, 2D and 3D Design, Ceramics, Fiber, Metalsmithing, Painting, Photography, Print Media, and Sculpture. The program is anchored by celebrated Artists- and Designers-in-Residence, one for each discipline, all of whom live and practice on campus alongside our students. U.S. News and World Report consistently ranks Cranbrook as one of the top ten schools in the country for graphic design. The college offers sixteen undergraduate and six graduate degree programs all of which are predominantly studio based. The College maintains an award-winning faculty of industry practitioners who emphasize the use of the latest technologies. Westphal College is home to the Mandell Theater, the Pearlstein Gallery, Drexel’s television (DUTV) and radio (WKDU 91.7 FM) stations, the Rudman Institute for Entertainment Industry Studies, MAD Dragon Records and Drexel’s Historic Costume Collection. The Graphic Design program prepares students to inform, persuade and entertain through the creative use of word and image and a balance of traditional and technical artistic studies. Graphic Design students learn to conceptualize, design and produce visual communication in books, magazines, posters, ads, packaging, web sites, interactive media, information systems, exhibition design, motion and many other forms of media. Students use this work to develop an expansive portfolio, which, along with six-month co-op experiences, prepares them for successful employment after graduation. Founded in 1979, it currently provides 44 degree programs for 17,000 students, and boasts 42,000 graduates. It is an educational leader for those pursuing careers in the entertainment and media industries. Full Sail has been recognized as one of the “Top Five Game Degree Programs” by Electronic Gaming Monthly and one of the “Best Music Programs” by Rolling Stone Magazine. It has been similarly recognized as among the best in the country for film, new media, and social media, and was recently named the “School/College of the Year” by the Florida Association of Postsecondary Schools and Colleges. Full Sail also offers on-campus and online Master’s, Bachelor’s, and Associate’s degree programs in areas related to animation, art, business, education, graphic design, film, marketing, web development, music, recording arts, sports, and video games. A program of particular interest to GDUSA readers is the Media Design MFA that can be earned online in 12 months. Full Sail graduate credits include work on OSCAR, Emmy, GRAMMY, ADDY, MTV Video Music Award, and Spike Video Game Award nominated and winning projects. Founded in 1885, GIT has a great blend of engineering, manufacturing, business, and design in its curriculum. It's also the alma mater of several prominent designers including Michael Arad, who designed the World Trade Center Memorial in New York City and "Trading Spaces" designer Vern Yip (Total Enrollment ~ 20,000). The two universities merged in 1969 to form the Indiana University-Purdue University Indianapolis (IUPUI). The school is home to about 30,700 students enrolled in 243 degree programs across two colleges and 17 schools. The Herron School of Art and Design offers BFA and MFA degrees in Visual Communication Design (VCD). A Design Production Minor is also on the menu and the College of Visual and Performing Arts at IUPUI’s Fort Wayne campus offers a BFA in VCD with a Concentration in Graphic Design. Founded in 1937, the Institute of Design is one of the rare species that pushes the boundaries of where the design discipline can play and win. Founded in 1885, KCAI is one of the oldest colleges of art and design in the United States. The school is home to more than 700 students and it offers BFA degrees in 13 areas from Animation to Sculpture. KCAI is a premier private, fully accredited, four-year college of art and design. Students studying for the B.F.A. degree can choose from a variety of majors, including animation, art history, ceramics, creative writing, digital filmmaking, digital media, fiber, graphic design, illustration, painting, photography, printmaking and sculpture. KCAI offers a strong degree in graphics arts, emphasizing on foundational preparation in the main aspects of design, including the manual arts such as drawing and print-based medium. Students will participate in internships and build their portfolio’s in preparation for starting their careers. Offered through the Graphic Design Department, the BFA program stresses collaborative work within a studio environment. Notable graduates include multimedia artist Robert Rauschenberg; ceramic artists Richard Notkin and Akio Takamori; graphic designer April Greiman, and sculptors Robert Morris, Kate Ericson and Mel Ziegler. Walt Disney took Saturday art classes at KCAI, his only formal training in art. Consistently recognized for its rigorous, diverse curriculum, the school’s academic programs are strengthened by first-rate support services, technology and practical learning opportunities. KCAI’s scenic 15-acre campus situates students between the Kemper Museum of Contemporary Art and the Nelson-Atkins Museum of Art, and the college’s gallery, the H&R Block Artspace, is located about two blocks from main campus. Founded in 1910, it is home to 27,500 students enrolled in more than 300 degree programs across dozens of colleges, schools, and departments. The College of Communication and Information, School of Visual Communication Design offers a variety of degree programs for aspiring graphic designers. Undergraduate options include BA and BFA degrees in Visual Communication Design. Graduate level options include MA and MFA degrees in Visual Communication Design. LSU welcomed its first class on January 2, 1860. The school, which is home to more than 29,000 students, offers more than 200 programs across 11 colleges and schools. The College of Art and Design at LSU offers several programs for future animators including BFA and MFA degrees in Graphic Design. The programs prepare students for a career in graphic design through experiences in the development of work in typography, print and editorial design, information design, digital imaging, packaging, environmental design, identity design, and branding. The College was founded in 1882 as part of the Portland Society of Art. It is one of 37 private, non-profit, degree-granting professional art colleges in the country, and one of only 18 such colleges not affiliated with a larger academic or arts institution. MeCA offers both a BFA and an MFA program, each of which offer a major in Graphic Design. MeCA is home to 350 students enrolled in more than 17 undergraduate art and design programs, an MFA program, and an MAT program. Programs for aspiring graphic designers include a BFA in Graphic Design. The program features studio visits to NYC and Boston, as well as the opportunity to complete an internship with companies such as Martha Stewart Publishing (NYC), L.L. Bean, American Eagle Outfitters, Portland Museum of Art and more. Founded in 1826, MICA is the oldest continuously degree-granting college of art and design in the nation. The College enrolls around 1800 undergraduate and 300 graduate students from 48 states and 50 countries, offering programs of study leading to BFA, MA, MFA and MPS degrees, as well as post-baccalaureate certificate programs. MICA offers a major in graphic design that offers students creative, intellectual, and technological skills to become design visionaries of the new century. Students will learn to develop content of media across the spectrum of publishing, which is anything from the printed page to the Internet. Programs for aspiring graphic designers include a BFA in Graphic Design (54 credits in the major), a BFA Studio Concentration - Graphic Design (18 credits in the concentration), and a BFA in Graphic Design + Humanistic Studies (54 + 48 credits in the major). Redefining art and design education, MICA is pioneering interdisciplinary approaches to innovation, research, and community and social engagement. Alumni and programming reach around the globe, even as MICA remains a cultural cornerstone in the Baltimore/ Washington region, hosting hundreds of exhibitions and events annually by students, faculty and other established artists. All of the above have earned MICA top rankings by U.S. News & World Report, The Chronicle of Higher Education, ID magazine, GDUSA, and others. Established in 1936, MCA is home to around 420 students from 25 states and 5 foreign countries. MCA offers more than a dozen art and design programs at the undergraduate and graduate levels. Programs for aspiring graphic designers include a BFA in Design Arts with a Concentration Graphic Design. Students may also opt for the MFA in Studio Arts, which provides the opportunity to create an individually tailored program of interdisciplinary study. This is one of the Art Institutes that provides an important source of design, media arts, fashion and culinary professionals. The Institute offers programs and degrees in Culinary Arts, Digital Image Management, Fashion, Web Design & Development, Graphic Design, Digital Filmmaking & Video Production, Digital Photography, Game Art & Design, Interior Design, Media Arts & Animation, Visual Effects & Motion Graphics and Interactive Media. Coursework is reviewed and influenced by industry leaders and prominent employers who determine what skills are needed in the workplace. Many of the University’s faculty members also are working in their respective fields outside of the classroom. The Graphic Design programs at AI Tampa teach students to combine form and function into a concept or product that is visually compelling and meets consumer needs. It provides both studio space and computer installations for its undergraduates majoring in Graphic Design. Founded in 1974, it is the successor to the Layton School of Art which was founded in 1920. The school is home to around 740 students enrolled in eleven major specializations and 15 minors. Aspiring graphic designers typically choose the BFA in Communication Design (CD). The program highlights internship opportunities at advertising and design firms in Milwaukee and around the nation, as well as access to MIAD’s Visual Resources Studio. MIAD CD graduates hold titles such as Art Director, Creative Director, Designer and many others. MIAD has a program for Communications Design that includes an internship at an advertising agency or design firm. For more than a century, the Minneapolis College of Art and Design has been a catalyst for creativity in the Twin Cities, the region, and the nation. Offering a direct, comprehensive, clear program full of clean lines, the College prepares students for designing everything from magazine print ads to new apps. Ideation, typography, and visual composition are the areas that students try to master, with deep study, inquiry, and exploration into each. Offering a B.S., B.F.A. and masters-level degrees. It offers a BFA in Communications Arts that looks at design concepts for several media platforms as they are applied in commercial use. NYU’s design programs include a BS in Digital Communications and Media, and a Masters program in Graphics Communication Management and Technology. Established in 1887, the school is home to around 33,900 students enrolled in more than 300 undergraduate and graduate degree programs across 12 colleges and 65 departments. The College of Design’s Department of Art and Design offers several programs for aspiring graphic designers. Programs include a BA in Graphic Design and a Master of Graphic Design. The master’s program allows students to enroll in a three-credit elective at nearby Duke University or UNC/Chapel Hill under NC State tuition. It has both a Graphic Design degree and an Art and Design undergraduate degree. It has a Department of Design that offers a major in Visual Communication Design. Established in 1918, Otis is the first independent professional school of art in Los Angeles. The school is home to 1,100 students and it offers more than a dozen art and design programs from Advertising Design to Sculpture. The Communications Art Department offers several programs for aspiring graphic designers including BFA and MFA degrees in Graphic Design. Otis is also known as an affordable Graphic Design school. The BFA program in graphic design at Otis is located within the Communication Design department, which also houses programs in Illustration and Advertising Design. Otis offers an excellent reputation and degree in Graphic Design, with a straight undergraduate offering in the Communication Arts Department. Research, development, and polished projects and portfolios are the central forces. Graphic Design majors concentrate on formal application and experimentation, technological proficiency, and innovative outcomes. The goal is to develop critical thinking and visual communication tools for careers in a changing and competitive workplace. During senior year students explore conceptual, theoretical, and experimental projects through individual proposals. They meet in cross-disciplinary teams led by faculty advisors and guest critics. The research and production methodologies developed during this year integrate personal vision with professional goals. Otis primarily prepares its graduates to work in the professional sphere; past graphic design graduates have worked for Apple, Anthropologie, Conde Nast, Disney, Interscope Records, Mattel, Sony, and Target. It’s a good choice for students who’d like to do design work for major companies and are interested in some of the more commercial aspects of graphic design. Graduates value structure, surface and form, but also consider the engagements and interactions of design with clients, audiences, and the culture at large. Otis College of Art and Design (OTIS) was established in 1918 by founder and publisher of the Los Angeles Times - General Harrison Gray Otis. The City of Angels is a cultural capital and its 524 cultural institutions and more than 100 different languages evince its diversity, and make it a stimulating place to study art and design. When students graduate, they join the professional communities of entertainment, art, design and fashion. Alumni and faculty are leaders in these communities and support recent graduates. Parsons School of Design at the New School was founded in 1896. It houses five schools, including the School of Art and Design History and Theory, the School of Art, Media, and Technology, the School of Constructed Environments, the School of Design Strategies, and the School of Fashion. Nearly 5,000 students are enrolled in 27 undergraduate, graduate, and associate degree programs. The School of Art, Media, and Technology embodies the frisson between art and design. The AAS in Graphics Design can be completed on campus, online or in combination and goes beyond basic technical knowledge to provide a complete design education. The program investigates up-to-the-minute tools and trends of the trade, including web design, while providing a solid foundation in traditional practices and concepts. The variety of undergraduate design programs carry specific concentration in Art, Media, Technology, Communications, Fashion, Illustration, Interior Design, Photography, and Architectural. As the programs are offered within an active fashion design institution, its students have a unique opportunity for networking in that particular industry. Their graduate programs are complementary and build upon the skills taught to enable the student to become a mastery at their desired specialty. The mission of the Graphic Design Communication program is to cultivate design strategists with an innovative spirit and superior critical thinking skills applicable to a diversity of human needs. Consistent with the University’s mission to provide professional training with a rigorous Liberal Arts and Business core. The Graphic Design Communication curriculum fosters an appreciation for design as a cultural craft with a relevant historical background, and a rapidly evolving future across multiple disciplines. The program is conceptually based as a designers’ highest value is to be able to generate ideas – that a designers’ intellectual property is his/her creative capital. The curriculum culminates with a B.S. degree: it embraces design thinking and strategic planning; features real-world assignments based on hands-on learning; and emphasizes traditional design skills and the ability to create and develop visual and verbal responses to complex visual communication problems across a variety of media. Students develop the ability to articulate these responses both orally and in writing. Student work regularly has won awards or been recognized by major design competitions, exhibitions and publications. This is a graduate-level communication arts school whose mission is to prepare students for creative practice and inevitable leadership. Thanks to a small, intimate environment, the school is able to break the boundaries of traditional instruction. The education is hands-on and interactive; there are no lectures, and no one gets lost in the crowd. Believing in the importance of good design, design that is useful and beautiful, students learn to render content with real meaning and to create innovative solutions that actually contribute to the culture. As the first school of its kind, Portfolio Center has been around for more than 30 years, it offers both full time and part time intensive programs under the expert guidance of seasoned, working professionals and students graduate with a Certificate of Professional Studies in Art Direction, Copywriting, Design, Web Design, Illustration or Photography. Portland State University was founded in 1946. It is home to 28,241 students enrolled in more than 120 majors, minors and concentrations across eight schools. The College of the Arts, School of Art + Design offers several programs for aspiring graphic designers. Offerings include BA and BS degrees in Graphic Design. The School of A+D also offers a Minor in Graphic Design. “The supremely effective education on offer at Pratt is about a re-imagining of everything we touch and shape - in a functional yet boundary-demolishing way shared perhaps only by RISD”. Pratt’s inspirational campuses in the Clinton Hill section of Brooklyn and in Manhattan on West 14th Street places it in one of the world’s cultural epicenters and provides its students with unparalleled training facilities. Globally recognized for its distinguished academic reputation, Pratt Institute is one of the world’s most prestigious independent colleges. Founded in 1887, Pratt offers undergraduate and graduate degree programs to 4,700 students from around the world in architecture, art and design, information and library science, and liberal arts and sciences. Pratt’s programs are consistently ranked among the best in the country, and its faculty and alumni include the most renowned artists, designers, and scholars in their fields who collectively have produced some of the most innovative and iconic works of our time. Pratt’s Undergraduate Communications Design department is the only program in the country to recognize and embody the convergence and integration of illustration, advertising and graphic design as the primary forces for the visual expression of ideas. And its Graduate Communications Design department has been educating graphic and package designers for over 40 years. Pratt Institute has an undergraduate Communications Design degree that can lead to a career in Graphic Arts, in Illustration or in Advertising Arts. Students spend their years immersed in, not one, but two strikingly different environments with lively art cultures. Students who select this route complete the first two years of their program on the Utica campus and are then guaranteed a seamless relocation to Pratt’s main Brooklyn campus at the beginning of their junior year. The PrattMWP campus allows students to achieve all the prestige and benefits of a Pratt art education at a location that develops their confidence, their individual voice and their insight into the world. PrattMWP shares its campus with the Munson-Williams-Proctor Arts Institute, which offers collections, exhibits, classes and events that attract artists and art enthusiasts from around the globe. Focusing on foundations of art in an intimate creative community, PrattMWP offers majors in Fine Arts, Communications Design, Art Education, and Photography. It is the perfect choice for students who prefer to transition to the big city with advanced skills and a tight group of friends. Communications Design students have recently been recognized by GDUSA, Print, NOW, UNESCO, Creative Quarterly, Society of Children’s Book Writers and Illustrators, and the United States Mint. The school has an undergraduate degree in Visual Communication and Design and a Masters Degree in Visual Communication. Purdue University was established in 1869. It is home to 38,788 students enrolled in more than 200 majors across 10 academic colleges and schools. The College of Liberal Arts is home to the Patti & Rusty Rueff School of Visual and Performing Arts. The School houses two departments—Art and Design and Theatre, three divisions—Dance, Music, and Purdue Galleries, and nearly 900 undergraduate and graduate students. The School offers two programs for aspiring graphic designers. Offerings include BA and MFA degrees in Visual Communications Design (VCD). All graphic design students have the opportunity to participate in the internship program and to show their work via special exhibitions. RISD is a private, not-for-profit, four-year art school founded in 1877. RISD is one of the oldest and best-known colleges of art and design in the U.S. Each year approximately 2,300 students from around the world pursue a creative, studio-based education at RISD, which offers rigorous bachelor’s and master’s degree programs in 19 architecture, design, fine arts and art education majors. Graphic design is one of the school’s top five most popular majors. Offerings include a BFA in Graphic Design and a two or three-year MFA in Graphic Design. Rich, multifaceted and encompassing a broad range of media, Graphic Design at Rhode Island School of Design respects the foundations of formal, aesthetic and analytical knowledge and skills while exploring the ever-changing context and function of visual communication. Since 1877, RISD has stood out as a leader in art and design education, attracting extraordinary people who thrive in its creative culture. As one of the first colleges of its kind in the country – founded simultaneously with the RISD Museum of Art – it has always been something of a maverick. The college is located in Providence, which offers its own vibrant art scene and is conveniently located between two other major cultural centers: Boston and New York. RISD has a long and venerable history, and has a deep and abiding belief in the value of a discipline-based, immersive art and design education with a strong liberal arts component. Its diverse programs in Architecture + Design, Fine Arts, Foundation Studies, Graduate Studies and Liberal Arts are rigorous, probing and supportive of learning and community-building across a broad spectrum of curricular and co-curricular options. Experts in their respective fields, RISD faculty are also extraordinarily dedicated teachers. RISD is famous for having two out of three Airbnb cofounders as graduates. Established in 1931 and created by circus baron, real estate developer, and noted art collector John Ringling, the school opened with 111 courses and just 75 students. Today, RCAD sits on a 35-acre campus that houses nearly 1,300 students enrolled in BA and BFA degree programs in 11 majors. Programs for aspiring graphic designers include a BFA in Graphic Design, which has been in existence 1980. RCAD graphic design students will “learn to create design solutions in print, motion, and interactive media with projects of all varieties.” Students gain real-world experience through internships with major firms and through “The Collaboratory,” which pairs teams of Ringling students with local businesses. Students will have the opportunity to work at RCADs in-house design firm on projects with external clients and for Ringling College events. RCAD design graduates have landed positions at Google, Leo Burnett, Microsoft, Trader Joe's, Wieden + Kennedy, LinkedIn, Yahoo, American Greetings, and more. “The College produces some of the most prepared, career-oriented designers in the workforce, the programs feature small class sizes, working professionals as professors, and top-of-the-line technology. The quirky blend of technical and art-oriented students help to mold the innovative thinkers. If you want your first pick of jobs out of college come to RIT." Founded in 1829, RIT is a private university located within the town of Henrietta in the Rochester, New York metropolitan area. RIT is composed of nine academic colleges, including the National Technical Institute for the Deaf. RIT’s Graphic Design division offers a fairly commercially oriented course of study. The undergraduate degree in graphics arts is a contemporary offering concerned with visual movement, navigation, sound, and digital and print presentations and projects. Combining creativity, critical thinking, research, and problem-solving, this degree seeks to inspire and educate. San Diego State University (SDSU) was founded in 1897. It is the oldest and largest university in San Diego and the third largest in the State of California. SDSU is home to around 30,000 students from more than 100 countries. It offers nearly 160 undergraduate majors and minors, 16 pre-professional programs, and nearly 100 graduate degrees and credentials. The school houses seven colleges including the College of Professional Studies & Fine Arts, which is home to the School of Art and Design. The School offers a variety of programs for aspiring graphic designers. Options include a BA in Applied Arts & Sciences with a Major in Art. This program features an Emphasis in Graphic Design. MA and MFA degrees in Studio Arts are also on the menu. Both graduate programs also offer an Emphasis in Graphic Design. Founded in 1899 as San Francisco State Normal School, It is now home to 30,500 students enrolled in more than 140 undergraduate and graduate programs, 17 credential programs and 38 certificate programs across seven colleges. The College of Liberal & Creative Arts is home to the Department of Design and Industry (DAI). The Department offers a BS in Visual Communication Design (Graphic Design and Interactive Digital Media). The BS in Visual Communication Design (BSVCD) program is for students who “intend to focus their studies on design problems along a spectrum anchored by graphic design and digital media and with outcomes including print graphics, information design, web design, interaction design, and motion graphics.” Aspiring graphic designers might also consider the Master of Arts (MA) in Industrial Arts, which allows students to study Visual Communication Design/Graphic Communications. A Minor in Industrial Arts is also on the menu, which covers graphics and digital media and design, among other related subjects. Many notable designers have graduated from Savannah, including Facebook's director of design, Kate Aronowitz, and graphic novel creators Joshua and Jonathan Luna, also known as the Luna Brothers. Offering more degree programs and specializations than any other art and design university, SCAD is uniquely qualified to prepare talented students for professional, creative careers. SCAD is a private, nonprofit institution, awarding bachelors and master’s degrees. Class size is small, allowing each student the opportunity to receive individual attention. Faculty members have distinguished backgrounds in their fields. The international faculty and student body come from all 50 states and 100 countries. In Savannah GA, SCAD offers a full university experience, while their Atlanta campus hums with creative and entrepreneurial energy. International campuses in Hong Kong and Lacoste, France offer firsthand experiences at world-renowned festivals, visits to famed historic locations and close encounters with some of the most famous works of art ever created. This versatile offering in Savannah, Georgia, offers everything from the B.A. to the M.F.A. as well as certificates and a minor. The classes are theory and practical-based, with courses that train, educate, and inspire designers to meet the demands of an ever-changing, dynamic job culture. SCAD offers its Graphic Design program through the School of Communication Arts. This a small college with one focus - graphic design. SAA offers personalized training to aspiring designers, preparing students for successful careers in the advertising industry. The SAA Associate Degree Program is a two-year program that leads to a degree in Applied Business in Advertising Art. The program consists of design courses that focus on creativity, typography, graphic design, photography, Web design, traditional illustration, digital illustration, 3D illustration, animation, video, art direction and professional development. Students learn the principles of writing for advertising, as well as presentation skills. SAA is committed to providing career services to recent graduates and alumni and with an average placement rate of 93%; SAA has a strong reputation among employers for educating designers who are creative and prepared for the demands of the advertising industry. Founded in 1866 as the Chicago Academy of Design, the School of the Art Institute of Chicago (SAIC) is home to 3,519 students enrolled in more than 25 programs. SAIC’s Visual Communication Design Department offers several programs for aspiring graphic designers. Options include BFA and MFA degrees in Visual Communication Design. The curriculum is structured to encourage the development of both generalized and specialized activities. Students will acquire a understanding of the implications, strategies, and roles of visual messages as well as the visual abilities necessary for conceptualization. The Department also offers a Certificate in Graphic Design that takes two years to complete. SAIC is one of the most historically significant accredited independent schools of art and design, which is located in one of the greatest American cities, Chicago. SAIC has received recognition from Columbia University’s National Arts Journalism survey as “the most influential art college in the United States” and has had a consistent ranking among the top three graduate fine arts programs in the nation by U.S. News and World Report. Founded in 1947, SVA is widely recognized as one of the finest art schools in the country for its innovative and experimental program philosophies, its participation in the cultural life of New York City, and the accessibility it offers to its unparalleled faculty of professional artists. Comprised of more than 6,000 students at its Manhattan campus and 35,000 alumni in 100 countries, SVA also represents one of the most influential artistic communities in the world. The school strives to teach and prepare students in all aspects of visual literacy, particularly visual communication. It strives to “help students understand scale, texture, symmetry, tension, line, color, tone, balance, contrast, pattern and perspective” and prepare students in a multidisciplinary major. The Design programs focus on teaching visual communication problem solving, a skill that can open the door to a host of rewarding careers. School of Visual Art’s programs are offers three separate majors that include Graphic Design, Motion Graphics and 3D Design. The mission of SVA is to educate future generations of artists, designers and creative professionals with undergraduate degree programs in art and design, rigorous and practice-based graduate programs in the visual arts and its allied fields and a continuing education program intended to meet the diverse needs of NYC’s professional art and design community. SVA is home to 11 undergraduate and 21 graduate degree programs in fields that range from fine arts to graphic design, photography to filmmaking, art criticism to art education. Together, the departments cover a broad range of creative endeavors, employ industry-leading professionals as faculty members and offer numerous and varied opportunities for students to engage with their chosen field. The SVA has a hefty list of notable alumni, including Pres Romanillos, who served as supervising animator at Disney and DreamWorks, and graphic designer Cojo, Art Juggernaut. One of our respondents said, "You gain a plethora of knowledge in the industry you wish, and the networking is amazing." This is a fully online school of visual arts offering degree and certificate programs in graphic design, Web design, digital media, and more. Founded in 1997, the school prepares students all over the world for careers in art and design by providing a thorough training in the technical, creative, and critical thinking skills required for professional practice. The Sessions College Graphic Design program is an intensive two-year Associate degree in which students build a foundation in design concepts and software skills and explore a range of media including page layout, print production, packaging, and branding and marketing. Want to channel that energy and passion into a truly rewarding career? For over 15 years Shillington has been teaching people to kickstart a career in the graphic design industry. Starting with a foundation in design theory and processes, the course moves quickly to have students designing beautifully considered, effective design solutions for print and digital media. In three months (full-time) or within one year (part-time), graduates have with a commercially relevant portfolio marked by technical prowess and creative flair. The school’s objective: to create a positive and inspirational learning environment in which students are taught relevant industry skills, ensuring they have the best possible chance of employment as a designer. The D School counts practicing designers like Klout's director of product design, David Baggeroer, as professors. Founded in 1870, Syracuse University (SU) is home to approximately 21,492 students enrolled in more than 400 programs across 12 colleges and schools and a graduate school. The S.I. Newhouse School of Public Communications houses the Graphic Design Program, which emphasizes “design, image, interactivity, motion graphics, and communications.” The Program, which leads to a BS, prepares students to work in both print and multimedia environments. Founded in 1884, it is home to 37,700 students enrolled in 420 academic programs across 17 schools and colleges. The Tyler School of Art at Temple offers several unique programs for aspiring graphic designers. Options include BFA and MFA degrees in Graphic & Interactive Design. Students in both programs have the opportunity to participate in Temple University’s Rome Program. The Program manages the Graphic Design Collaborative Workshop, which takes place during a six-week summer session in Rome. Established in 1903 as Southwest Texas State Normal School, it is now home to more than 38,000 students enrolled in nearly 200 programs across nine colleges. The College of Fine Arts & Communication houses three schools and two departments. The School of Art + Design offers two programs for aspiring graphic designers. Options include a BFA in Communication Design (ComDes) with a Graphic Design Focus and an MFA in Communication Design (ComDes). Classes for both programs are taught in a studio environment, with class sizes limited to 20 students. The programs also highlight internship opportunities with a variety of Austin and San Antonio firms, as well as companies across the U.S. and in Europe. It encourages freedom of expression and challenges students to reach the fullest potential. The College’s BFA in Graphic Design provides the tools and opportunity to complete extraordinary design solutions. The full-time graphic design faculty has earned the highest degrees in the field and come to the classroom as published designers and experienced teachers. The College has been named one of the top design schools in the country by the Art Directors Club NY. Students have secured internships and job placement at nationally acclaimed design firms such as MTV, Abercrombie and Fitch, Anthropologie, Converse, Fox Studios, Nike, ESPN, and Hallmark, as well as with renowned designers such as Michael Beirut, Alexander Isley, April Greiman, Woody Pirtle, Walter Bernard and Milton Glaser. Almost 100% of graphic design graduates achieve full employment in their field, within one year of graduation. Prospective employers are invited to campus to meet students and view portfolios, and the seniors attend job fairs and portfolio reviews. Additionally, graduates have been accepted into prestigious graduate programs including Yale, Stanford, Tyler School of Art, SVA, SCAD, RISD, VCU, RIT, Syracuse and Kent State, the program has alumni living and working in 33 states and abroad. BFA in Graphic Design - Learn the skills needed for exciting careers in the fields of visual communications. Virtually all organizations depend on compelling visual communication to successfully convey ideas and engage customers. The Graphic Design program at Berkeley College is both innovative to give students more career options, and thorough to help them stand out in the job market. Along with the history of graphic design and a strong foundation in art and design principles, the curriculum exposes students to the problem-solving process using a broad range of traditional, digital, and emerging media. Instructors are chosen for both academic excellence and relevant professional experience. They share firsthand occupational knowledge that can help prepare students to enter the job market. Portfolios, internships, and capstone projects are completed prior to graduation, as students work closely with the Career Services Department to secure future employment. Students have the opportunity to interact with Interior Design and Design Management students, exhibit their work in the Gallery at Woodland Park, and contribute to the department website. Students may also participate in field trips, attend guest lectures and opening receptions, and network with members of the professional design, art, and film community. Bachelor & Master Programs - UCLA offers an undergraduate degree in Design Media Arts, with a focus on digital, mass media, and an emphasis on and enrichment through public research. The Design Media Arts's partnership with Ogilvy & Mather enables students to learn directly from a brand expert for an entire semester. The school's top employers include Wieden & Kennedy and Walt Disney. Established in 1885, it is home to more than 40,000 students enrolled in more than 300 majors across 21 colleges, 20 schools, and dozens of departments. The College of Fine Arts is home to the School of Art, which offers two programs for aspiring graphic designers. Options include BFA and MFA degrees in Studio Art with a Visual Communications Emphasis. Program highlights include a wide range of internship opportunities and a variety of study abroad programs. Please note that the name of this program will become “Illustration & Design” effective Fall 2016. The program will still provide the education and training needed to become a graphic designer. The College (DAAP) houses nationally top-ranked programs in architecture and design that highlight the college’s award-winning faculty (many with industry experience) as well as the university’s renowned cooperative education program. Via the university’s co-op program, ranked in the nation’s top 10 by U.S. News & World Report, all design students are required to work professionally paid semesters with design employers around the globe. These students graduate with 20 months of such professional experience on their resumes and in their portfolios. Graphic Arts Bachelor & Master Programs - The College of Design takes a global approach, preparing designers for a global, and not just national community. The School of Design aims to prepare its students to be skilled professionals who can ably work in local and global markets while respecting the diversity of the human community. Graphic communication design students work for global employers including LPK headquartered in Cincinnati, Ohio; Apple Inc. of Cupertino, Calif.; Doblin of Chicago, Ill.; Gallagher & Associates near Washington, D.C.; Pentagram Design headquartered in New York City; Target Corporation in Minneapolis, Minn.; and sporting goods company Salomon, headquartered in Annecy, France.